MISSION BEACH ACTIVITIES & ATTRACTIONS, RESTAURANTS, TOURS & TRANSPORT! In the middle of the Cassowary Coast, less than two hours drive from Cairns or Townsville, is Mission Beach. Flanked by World Heritage listed rainforest, with a wide, flat beach stretching for 14 kilometres - not to mention Dunk Island and the Great Barrier Reef lying just offshore - Mission Beach is one of our favourite spots in Tropical North Queensland... and therefore the world! SCROLL DOWN OR USE THE LINKS ABOVE TO FIND MORE INFORMATION ABOUT MISSION BEACH. OR CLICK ON ANY OF THE HIGHLIGHTED TOWNS ON THE MAP TO VISIT SOME OF THE OTHER GREAT DESTINATIONS ON THE CASSOWARY COAST. Mission Beach was named after an Aboriginal mission which was established here in 1914 by the Queensland Government to avoid opium addiction among Aborigines and to ease conflict with the European settlers. It was more a penal settlement than a religious mission. In 1918 the Mission was destroyed by a cyclone, and the Aborigines living there were moved to Palm Island. Nowadays, Mission Beach is a thriving but idillyc and relaxed beachfront town with more than 14 kilometres of pristine golden sandy beaches lined with palm trees. It is one of the Tropical North's best kept secrets. Surrounded by two World Heritage areas, the Great Barrier Reef and the Wet Tropics Rainforest, Mission Beach is the perfect place to break away from your everyday life. The beaches in the Mission Beach area are, without a doubt, the best mainland beaches within the Great Barrier Reef World Heritage Area and are virtually unspoilt by man's intrusion. So why not leave your stress at home and prepare yourself for a place where the only traffic jam will be caused by cassowaries crossing the roads??? well, that's if you are lucky enough to see one. As locals say, it is paradise! Bingil Bay is only about five kilometres north of Mission Beach. A very picturesque beach with fringing coconut trees, Bingil Bay is considered by many to be the prettiest beachfront in the area. Wongaling is Mission Beach's central hub, with a supermarket, a video/dvd hire, a pharmacy, a bottle shop and a few specialty shops along with some caf�s and restaurants. Dunk Island is only 10 minutes away by water taxi from Banfield Parade, in Wongaling Beach. It is actually in South Mission Beach where the original mission was located. It is the southern-most beach in the Mission Beach area, a friendly township ideal for people who want to relax. The views of Dunk Island are dramatic and thanks to the boat ramps as well as the tranquility, South Mission Beach is a very popular holiday destination for families, fishermen and executives running way from stress alike. Just offshore from Mission Beach are some of the world's most magnificent islands, many of which are declared national parks. These islands are a beautiful spot to spend some time, whether it is only a few hours or a few days. And the best way to get to the Great Barrier Reef. There are numerous holiday resorts and accommodation houses available to suit every budget and occasion, including luxury beachfront apartments, villa's resorts, motels, hostels, caravan parks and camping sites, cabins, bed and breakfasts and farmstays. All accommodation facilities have been built to take advantage of the magnificent ocean views, golden beaches and tropical gardens. Of course, Mission Beach offers a excellent variety caf�s, wines bars and restaurants as well as all the other facilities you will need for your perfect vacation. An experience you will never forget... guaranteed! Mission Beach and the incredible islands of the Coral Sea provide the backdrop making this the premier drop zone in the whole of Australia. Skydive Mission Beach (Skydive Australia) provide FREE return transfers from all Mission Beach -and Cairns- accomodation and full training and instruction from their highly experienced professional team of tandem skydive instructors. The Girramay and Jirrbal Elders of the Jumbun Aboriginal Community invite you to visit their small community and immerse yourself in their unique rainforest culture. The community is located at Murray Upper, between Cardwell and Tully/Mission Beach (Just follow the signs to the spectacular Murray Falls). The tour begins at the Community Store. Your two and a half hour tour begins with an introduction to local Girramay and Jirrbal culture. You will be shown the precious artefacts kept in the community "Keeping Place" and enjoy refreshments. You will then meet your guides at Moombay, a beautiful site on the Murray River and a favourite camping spot of the Old people that is still being used today. During a guided rainforest walk you will be introduced to the rich cultural knowledge about the plants and animals around you. You will see mija (shelters) which rainforest Aboriginal people used to live in, and demonstrations of basket weaving and traditional jewellery-making. A unique cultural experience that will stay with you well beyond your holiday. Probably the most popular attractions of Mission Beach, and the whole Cassowary Coast are the beaches. At Kurrumine beach, where fringe coral merges with the open beaches, snorkeling is about as good as it gets. Bedarra Island is said to have more beaches than guests, Dunk Island has won the title of Australia's most beautiful tropical rainforest island and Cardwell, in our opinion, has one of the most impressive beaches of the world. Clump Point, at the northern end of Mission Beach, is the departure point for cruises to the Great Barrier Reef, Dunk Island and daily island-hopping tours. The lookout at Clump Point offers breathtaking 360� views over the sea, Dunk and the Family Islands, with the rugged peaks of Hinchinbrook Island off in the distance, the golden curve of the beach and the rainforest-clad mountains behind. It has always been an Aboriginal meeting place of great significance for the Djiru people, the traditional owners of this land. Boat Bay, the northen-most point of Clump Point is a wonderful place for catching Barramundi. Whether you are a vigorous bushwalker or you are looking for sun, the Cassowary Coast won't leave you dissapointed. Mount Bartle Frere and Mount Bellenden Ker are the two highest mountains in Queensland, and are visible from most places in the area. The valley that lies between the mountains is filled with wonderful walking trails walks and it is the place where you will encounter many of the region's extraordinary flora and fauna. The summit trails can be quite strenous and only suitable for the fit and adventurous. The Eubenangee Wetlands, north of Innisfail, provides easy tracks to waterfalls and is a paradise for birdwatchers. And if you are in the area, visiting the Wallaman Falls, Australia's tallest waterfall, about 305 metres, located west of Cardwell. However, check our NATIONAL PARKS page for more information about National Parks' walking tracks and other attractions in the area. The Mission Beach area also provides a comprehensive range of walking experiences that allows the visitor to explore the beautiful rainforest and coastline. These tracks vary from 1.5 kilometres long to seven kilometres and are suitable for the whole family. The Licuala Fan Palm Walk in the Licuala National Park, where you may see the rare Cassowary, the famous iridiscent blue Ulysses butterfly, scrub turkeys or wallabies; the Bicton Hill walk, a four kilometre circuit track in the Clump Mountain National Park; the Cutten Brothers' Walking Track, dedicated to the pioneering efforts of the Cuttens and situated on the Clump Point Jetty; the Dunk Island Walking Track, a nine kilometre walk that will take you around the island; or the Edmund Kennedy Walking Track, that stretches for seven kilometres, from South Mission Beach to Tam O'Shanter Point, Turtle Bay, Kennedy Bay and back. Check the Visitors Information Centre for a Walking Track Guide. 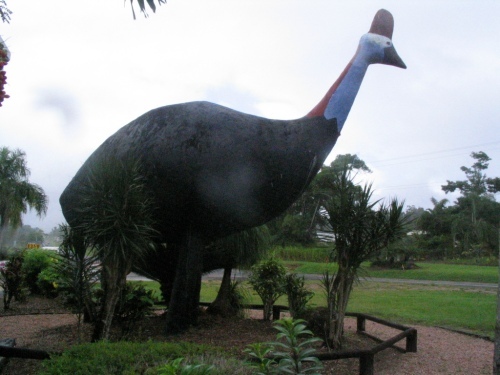 We have to start by pointing out the monument to Mission Beach's most notorius character... the Cassowary. Located at Wongaling Beach, the Big Cassowary, a five metre high monument, could be the only place in Mission Beach where you spot one. They're generally a rather shy and elusive bird. If you're keen to view a Cassowary in the wild, please visit our BIRDWATCHING page for more details on the best spots, and also for safety tips. To discover the numerous other 'Big Things' in Tropical North Queensland, please visit our BIG THINGS page. But if there's something the Tully River is famous for, it's white water rafting. If you want to have a exciting and adventurous day, this is the way. Grade four Tully River, with notoriusly named rapids such as 'Alarm Clock', 'Wet and Moisty', 'Staircase' or the dramatic 'Theatre' is great for practising such an exhilarating sport. Book a tour with one of the many companies that will provide you with an unforgettable rafting experience and make your friends back home wish they were here. Mission Beach is one of the closest access to the Great Barrier Reef. Although it is very popular with tourists and holiday makers, it still doesn't have the hustle and bustle of other tourists destinations. So if you want to avoid crowds and go for a quieter holiday without missing out on any of the facilities a tourist destination offers, Mission Beach is the place for you. Don't forget that Dunk Island is just off the coast and it also provides fantastic diving and snorkelling. Mission Beach is not the only place in the Cassowary Coast good for fishing. The three rivers of the area, the Tully, the Murray and the Hull - along with the numerous creeks - provide fishermen with lots of different catches. Sooty Grunter, Jungle Perch, Eel-tailed Gudgeon, Tarpon, Mangrove Jack, and of course, Barramundi, the main species of fish in the Murray, are some of the popular target species. Starting out from Mission Beach and Dunk Island, you'll visit some of the Reefs most spectacular areas. Explore magnificent unspoiled sites or dive the 'Lady Bowen' wreck or even snorkel around your own deserted island. Mission Beach Adventure Tours offer a walking tour led by members of the Girramay tribe, providing bush tucker, boomerang and spear-throwing demonstration as well as a barbecue meal. Join one of a number of different fishing and birdwatching tours on the Hull River. Learn how to set traps for the elusive Queensland mud crab. Into the evening you'll be equipped with a spotlight as we go in search of the infamous saltwater crocodile. Take a relaxing and personalized cruise with Quick Cat Cruises to the Outer Barrier Reef, and visit Dunk Island on the same day. Quick Cat Scuba Adventures operates diving and snorkelling services on board Quick Cat Cruises. Their destination is Beaver Cay Marine Sanctuary, on the Outer Barrier Reef, but the tour also includes a visit to Dunk Island on the same day. Mission Beach Boat Hire offer the rental of boats, dinghies, sailing catamarans and sea kayaks for the exploration of the local coast and Dunk Island. With Coral Sea Kayaking you can enjoy Dunk Island as nature intended. Simply glide along the surface of the water and enjoy the views of the colourful corals and watch the turtles and rays swim past. Fishin' Mission offer fishing tours to suit everyone's taste. Whether is it game fishing, reef or island fishing, Fishin' Mission cover every single angle to provide you with a fishing experince you will enjoy to the limit. If you are an adventurous person or want to try something new and exciting, tamden skydiving is for you. They also offer bungy jumping and water rafting in the Tully River. Or you can go in for jet skiing, kayaking, hot air ballooning and nearly everything and sport you can think of. The Monster Markets are held on the last Sunday each month from Easter to November at Recreation Centre. They commence at 8:00am and finish around 1:00pm. The markets mostly feature local fruit and vegetables, log furniture, arts and crafts, bric-a-brac, trash and treasure and plants. Relax and enjoy North Queensland produce as imported goods are not allowed. The Mission Beach Market, located in the park opposite the Hide Away Caravan Park, is held on the first and third Sunday of each month. Open from 8:00am to 12:00pm, the market offers a wide array of tropical fruit and vegetables, trash and treasure, clothing and craft items. For more details about these and other markets in the region, visit our MARKETS page. Mission Beach has numerous regular activities and festivals for all to enjoy and take part in. The Mission Beach Aquatic Festival is an annual event for the whole family. During two days Wongaling Beach is thriving with stalls, games, competitions, beach volleyball, treasure hunt, tinnie races, lolly drop and live music as well as lots of activities on the water. Food and drinks available. The Mission Beach State School Banana Festival, held in August in the grounds of the state school, is a great fun day for the kids and those not so small! Includes stalls, fun foods, live bands and more at the primary school grounds. For more details about these and other events in the region, visit our TROPICAL NORTH QUEENSLAND EVENTS CALENDAR. Mission Beach is the most visited destination on the Cassowary Coast, and has a great supply of accommodation. Mission Beach holiday accommodation varies from spacious holiday homes to luxury resorts to home style bed and breakfast accommodation, not to mention a selection of caravan parks and campgrounds, with some offering self contained villas and modern ensuite cabins. There is self contained apartment accommodation and affordable motel lodging as well. Mission Beach has long been a favourite destination among backpackers too, and there are a number of backpackers hostels to choose from. If it's family friendly accommodation you're looking for, or budget accommodation while you enjoy the Cassowary Coast, Mission Beach has something for everyone. Please visit our MISSION BEACH ACCOMMODATION section, or use the buttons in the right hand column to choose the style of Mission Beach accommodation that suits you. A festival of taste, a place where food, wine, service, ambience and experience combine to create a place to come together and celebrate a special event, or just another day in paradise. Dine in or takeaway. BYO. Open for lunch from 11.30am to 2:00pm, and dinner 5:00pm to 9:00pm. Closed Tuesdays. Friends licenced restaurant is one of Mission Beach's most acclaimed dining experiences, where you can enjoy the gourmet delights of inventive Australian cuisine influenced by the zesty tastes of the Mediterranean and Asia. Open Wednesday to Saturday from 5:00pm. Sunday 10:00am to 9:00pm. Closed Monday & Tuesday. Great range of Italian cuisine. Takeaway or dine in. Phone (07) 4068 8401 Dine in or take away. Fresh seafood and char grilled steaks. Authentic Indian Food. Dine in or takeaway. Open 7 days. Offering a selection of modern Australian cuisine, fresh local produce and friendly North Queensland service. Extensive wine list, cocktails galore and a range of excellent beers. The Tilt Train stops at the cities of Ingham, Cardwell, Tully, Innisfail, Babinda and Gordonvale on its way to Cairns from Brisbane. Allow around 12 hours to make the whole trip. Mission Beach has a local taxi service. Phone 0429 689 366.